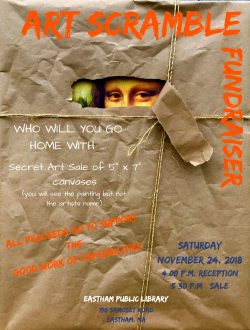 The Eastham Painters Guild took part in the very successful Art Scramble fundraiser for Cape Abilities at the Eastham Public Library on November 24. If you missed the main event, don’t despair – there is artwork still available and on display at the library for the remainder of November. All proceeds benefit Cape Abilities, a Massachusetts non-profit disability services agency founded in 1968 that serves individuals with a broad range of physical and mental challenges. They provide jobs, homes and other services and support for people with disabilities across Cape Cod. The organization has centers in Hyannis and Eastham, with a satellite office in Falmouth.